Fresh from the inspiration of Ragas Live Festival, we tried our hand at a novel combination of styles an instruments. Mauritania’s greatest singer, Noura Mint Seymali and her husband/guitarist, Jeiche Ould Chighaly performed live in studio with two Brooklyn-based Hindustani musicians Jay Gandhi (bansuri flute) and Ehren Hanson (Tabla). They met at the ASAMAAN Festival of Music & Astronomy in the Gorée Island – Dakar, Sénégal on April 2013 but had never performed together until this day. We also got a chance to share a track from Noura’s burning new album Tzenni. Noura Mint Seymali is a nationally beloved star and one of Mauritania’s foremost musical emissaries. Born into a prominent line of Moorish griot, Noura began her career at age 13 as a supporting vocalist with her step-mother, the legendary Dimi Mint Abba. Trained in instrumental technique by her grandmother, Mounina, Noura mastered the ardine, a 9-string harp reserved only for women. Seymali Ould Ahmed Vall, Noura’s father and namesake, sparked her compositional instincts, himself a seminal scholar figure in Mauritanian music; studying Arab classical music in Iraq, devising the first system for Moorish melodic notation, adapting the national anthem, and composing many works popularized by his wife, Dimi. Reared in this transitive culture where sounds from across the Sahara, the Magreb, and West Africa coalesce, Noura Mint Seymali currently drives the legacy forward as one of Mauritania’s most adventurous young artists. Fueled by the exploratory sound of her husband Jeiche Ould Chighaly’s emotive psych guitar lines, Noura and Jeiche formed their first “fusion” band in 2004. Jeiche, a master of the tidinit (aka. ngoni, xalam), brings the force of yet another important line of Moorish griot to bear, translating the tidinit’s intricate phrasing to a modified electric guitar with heroic effect. His unique sound, mirroring vocal lines and then refracting their melodies into the either, was born out of years presiding over wedding ceremonies, directing the dance often as the sole melodic instrument. In addition to his work with Noura, Jeiche remains one of Nouakchott’s most sought after guitarists for traditional ceremonies. 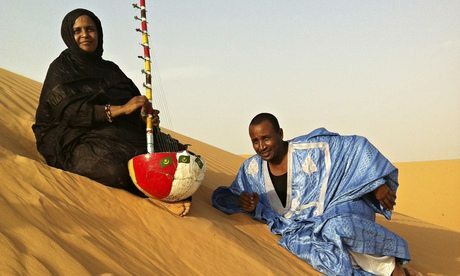 After two albums – Tarabe (2006) & El Howl (2010) – released locally in Mauritania and years of experimentation adapting Moorish music to various pop formations, Noura Mint Seymali’s current band is a concise return to the roots, a light formation led by the “azawan,” a word in Hassaniya that refers to the collective ensemble of traditional instruments; the ardine, tidinit, guitar. Backed by a declarative, funk-speaking rhythm section, composed of Ousmane Touré (bass) and Matthew Tinari (drums), the band has made a formidable debut on the international stage, releasing two EPs – Azawan (2012) & Azawan II (2013) – and touring widely. The band’s first full-length album for the international market – TZENNI – is set for release via Gliiterbeat Records on June 20, 2014 and to be followed by an extensive North American tour. Though performances at events like globalFEST (USA), Festival-au-Desert (Mali), Hayy Festival (Egypt), Jeux de Francophonie (France) and Festival Timitar (Morocco) and collaborations with artists like Tinariwen, Bassekou Kouyaté, and Baaba Maal, the band is actively exposing Mauritanian roots music to the world. In a rare merger of cultural authority and experimental prowess, Noura Mint Seymali applies the ancient musical traditions of the griot with a savvy aesthetic engagement in our contemporary moment, emerging as a powerful voice at nexus of a changing Africa.